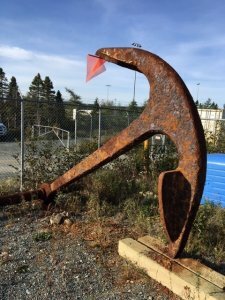 This week, Donna Teasdale, Archaeological Conservator, and her intern Josh Forth were in Portugal Cove-St. Philip’s to help the Town’s Heritage and Programs Services Coordinator do some conservation work on the anchor that was retrieved from the Portugal Cove Ferry Terminal. Donna runs the conservation lab for the MUN Archaeology Department and Josh is currently working with Donna on the internship component of his Cultural Heritage Conservation and Management Program through Fleming College. 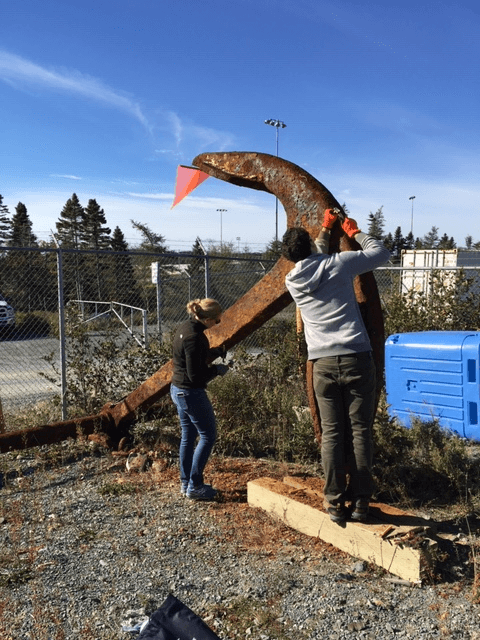 In these pictures, you can see them working to carefully remove the crust that has formed on the anchor to prepare it for the next conservation steps.